BATON ROUGE – Entergy Louisiana customers, including those in Bossier, will receive more than $70 million in refunds on their January bill and an ongoing $9.4 million rate reduction. It comes as part of an agreement involving the cost to replace steam generators at the Waterford 3 nuclear plant. The Louisiana Public Service Commission approved the agreement at its Dec. 21 meeting held in Kenner. 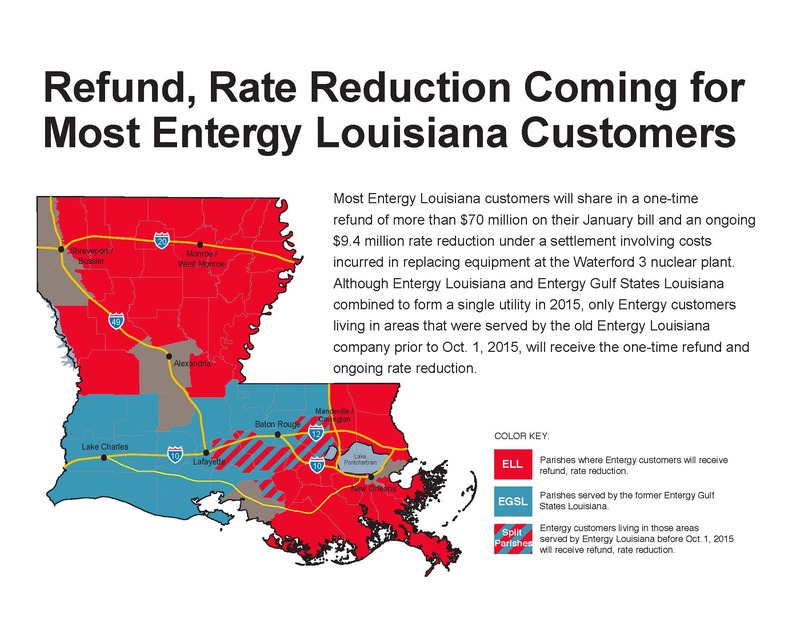 Although Entergy Louisiana and Entergy Gulf States Louisiana combined to form a single utility in 2015, only customers living in areas that were served by the former Entergy Louisiana company will receive a one-time refund and ongoing rate reduction. Typical residential customers using 1,000 kWh per month will receive a one-time refund of $37.73 on their January bill as well as an ongoing rate reduction of $0.43 per month. “This settlement represents good news for our customers and resolves a long-standing issue for our company,” said Phillip May, president and CEO of Entergy Louisiana. All Entergy Louisiana customers living in the following parishes will receive the refund and rate reduction: Assumption, Avoyelles, Bienville, Bossier, Caldwell, Catahoula, Claiborne, Concordia, East Carroll, Franklin, Grant, Jackson, Jefferson, LaSalle, Lafourche, Lincoln, Livingston, Madison, Morehouse, Natchitoches, Ouachita, Plaquemines, Red River, Richland, Sabine, St. John the Baptist, St. Bernard, St. Charles, St. Helena, St. James, St. Tammany, Tangipahoa, Tensas, Terrebonne, Union, Vernon, Washington, Webster, West Carroll and Winn. Also eligible for the refund and rate decrease are Entergy customers living in those portions of Ascension, Iberville, Livingston and St. Martin parishes that were served by Entergy Louisiana prior to Oct. 1, 2015. Entergy Louisiana customers in those areas paid to build the Waterford 3 nuclear plant, which was completed in 1985, and are paying the cost incurred to replace the plant’s steam generators in 2012. The original steam generators needed to be replaced to address an industry-wide issue with similar vintage equipment so that the plant could continue to provide significant economic benefits to customers by producing low-cost, carbon-free energy for Louisiana beyond the plant’s original licensed life. During the manufacturing process, the replacement steam generators were subject to a hydrostatic pressure test in accordance with industry codes and standards to ensure safe operation. The testing revealed distortions in the stainless steel lining that had not been previously seen in the industry on equipment of similar size and design. This unprecedented issue and the time required to make appropriate repairs delayed completion of the project by approximately 18 months and increased the project’s cost. The increased cost is the subject of the agreement approved by the commission. After the project was completed in December 2012, the LPSC initiated a proceeding to evaluate Entergy Louisiana’s management of the overall project. Prudence reviews of large projects are a routine part of the regulatory process. An administrative law judge ruled Entergy Louisiana prudently managed the project, selected qualified contractors, and found that it could not have anticipated the damage to the replacement steam generators. However, the ALJ also ruled the designer and fabricator of the replacement steam generators were at fault and assigned the blame to Entergy Louisiana. Based on the alleged negligence of the project’s contractors, the ALJ recommended disallowing $67.38 million in capital costs currently reflected in customer rates as well as the replacement power costs. While the agreement approved by the commission similarly calls for a disallowance of costs and resulting refund to customers, it does not adopt the ALJ’s findings. “Settling this issue is in the best interest of all stakeholders, and it avoids the potential adoption of a flawed finding regarding Entergy Louisiana’s responsibility that could have cost Entergy Louisiana customers millions in higher rates in the future,” May said.